Chrysler’s Ram truck division was looking to make its vehicles more fuel-efficient, but it didn’t try to use batteries to accomplish this goal. Instead, Chrysler used compressed natural gas (CNG) to power a version of its Ram 2500 Heavy Duty pickup. This green truck was unveiled at the 2012 Work Truck Show in Indianapolis. Natural gas is popular with fleet customers because it burns cleaner than gasoline and is often cheaper when bought in large quantities. Since natural gas filling stations are virtually nonexistent, it is not really a viable choice for individual consumers, although Honda does make a CNG-powered Civic. The modifications to the Ram’s 5.7-liter Hemi V8 were minor; it can still run on gasoline when needed. Changes include: new cylinder heads with redesigned valves and valve seat material, a new fuel rail and injectors for the natural gas, different spark plugs, and a reprogrammed engine management computer. The main difference between natural gas and gasoline is that natural gas has a higher octane rating, requiring a higher compression ratio. To store CNG, two 130-liter tanks were installed behind the Ram’s cab. They are mounted to the frame and covered by a steel enclosure. The two tanks hold the equivalent of 18.2 gallons of gasoline, giving the Ram a 255-mile range, plus an additional 122 miles with the backup gasoline tank. Drivers can fill up with either CNG or gasoline from the normal filler door. When starting, the Ram uses a small amount of gasoline (hence the two sets of fuel rails and injectors), then switches over to natural gas. If the natural gas runs out, the engine management computer can seamlessly switch over to gasoline. 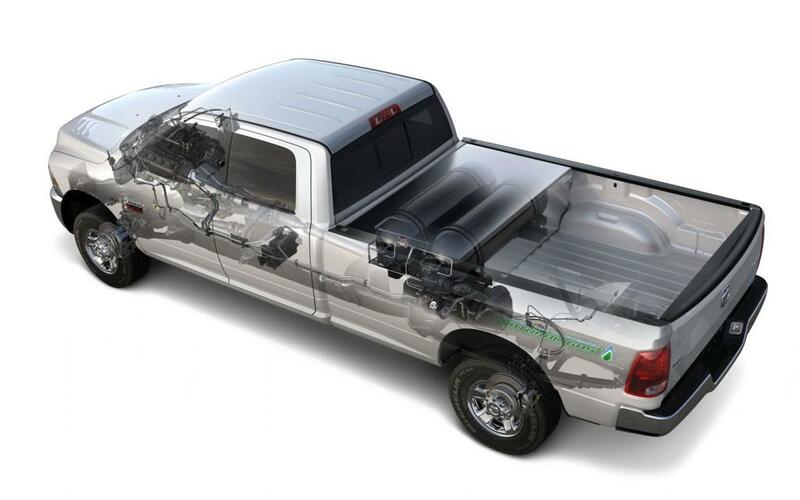 The Ram’s powertrain components, including the CNG bits, are covered by a five-year/50,000-mile warranty; the fuel system is covered under the truck’s three-year/36,000-mile bumper-to-bumper warranty. All CNG conversions will be done at Chrysler’s Saltillo, Mexico plant. With the Ram 2500 Heavy Duty CNG, Chrysler has at least taken a step toward making big, thirsty trucks more environmentally friendly. This is a relatively unexplored area of the green vehicle market, but one that could be pretty lucrative if more businesses try to take advantage of CNG’s low price. General Motors apparently had the same idea: it recently launched bi-fuel versions of its Chevy Silverado and GMC Sierra, which can run on gasoline or natural gas. Much emphasis is placed on reducing the carbon footprint of the average commuter, but with thousands of vehicles logging countless miles in commercial use every day, it seems like fleet operators could make a big difference by deploying greener cars and trucks.